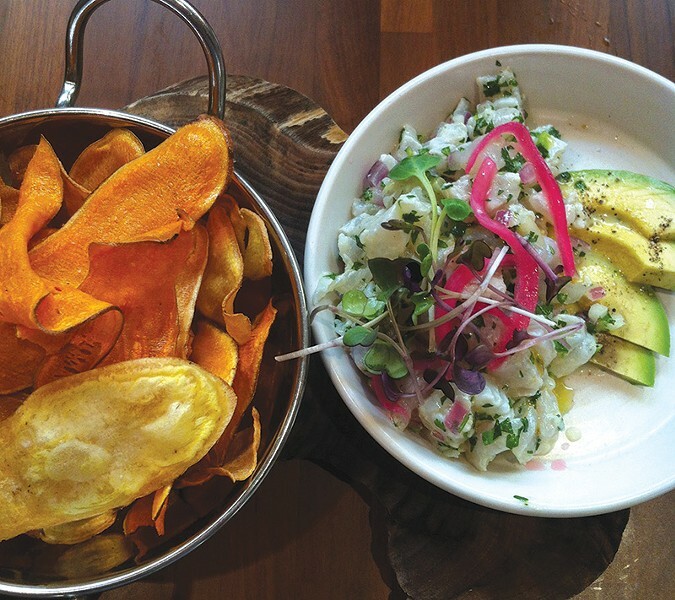 SEE FOOD Ceviche is one of the standouts from chef Kory Stewart. I imagine it's easy to play it safe when opening a restaurant attached to a resort. If it's the vacationing folk you're catering to, they'd probably eat anything you serve them, as long as it's close to their room. That could have been the fate at the new Sam's Social Club at Calistoga's Indian Springs Resort & Spa. Named after resort founder Samuel Brannan, this is Indian Springs' first full-service restaurant. A number of things take Sam's to a different level. It's both elegant and fun. Vacationing and feeling glitzy are easy here, even if you live nearby. The new establishment fits right into the country-club motif. There's beautiful scenery, a fire pit and outdoor sitting. All spaces exhibit a laid-back, easy-going vibe, with muted beige and sandy hues blending well into the natural setting. It's a restaurant where you wear designer flip-flops and spend hours relishing the summer weather. With plenty of dining opportunities in Calistoga, chef Kory Stewart had to go beyond the obvious. The dinner menu does contain some classics like the hamburger ($15) and blue cheese salad ($12), but Sam's isn't afraid of adventure either. Grandma will be happy, but so will the millennial foodie. We started with a couple of snacks, $6 each. The deviled eggs, saved from banality by a hint of truffle oil and a crispy sunchoke chip on top, were a promising start. The Brussels sprouts were less creative. Fried and served with a lemony aioli, they'd be a perfect side dish along with something more dominant, but as a standalone, they left me wanting. From the appetizer list, almost everything was a hit. The butter lettuce salad ($11) had crunchy fennel, lettuce and creamy avocado blended nicely with juicy navel oranges and flakes of manchego cheese. The market ceviche ($16), highly recommended by the knowledgeable waiter, was satisfying and fresh. Served with sweet potato crisps and avocado slices, it set us in a breezy, ocean-centric mood we decided to keep going with the grilled octopus ($13). It was on the rubbery side, but the sweet and tangy romesco sauce saved the day, even lending itself to the leftover Brussels sprouts. Being able to make vegetarians and vegans smile is mandatory for a modern-day restaurant, and Sam's addresses the issue with an intriguing dish of trumpet mushrooms, sunchoke purée, corn, tomatoes and zucchini ($25). The sunchoke purée delivered deep, earthy tones, and the mushrooms played a meaty, juicy role. The ingredients were individually flavorful, but the components didn't come together as harmoniously as I'd hoped and left me craving a bigger flavor moment. The kitchen has a more traditional approach to dessert: chocolate Valrhona pudding, and a strawberry and rhubarb crisp (both $8). Both were great. The kitchen may take some time to bring all of its menu up to speed, but Sam's Social Club already has a lot going for it. A resort restaurant that feels truly indulgent and memorable? Easier said than done, and Sam's got that part totally right. Sam's Social Club, 1712 Lincoln Ave., Calistoga. 707.942.4913.